Not going to Reading and Leeds? 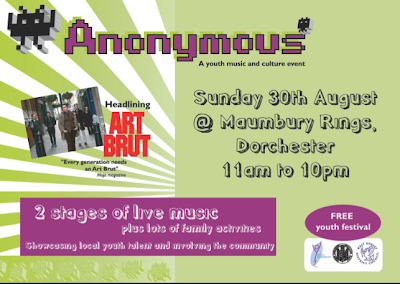 On Sunday 30th August we're playing for free at Anonymous festival in Dorchester. It is a festival organised by the young people of Dorchester. Some of whom I met when they won a Phillip Lawrence award in 2007. We were flattered to be asked to headline. I was born in Weymouth which is just round the corner and grew up in Poole which is just down the road. I wish that somebody had been organising free festivals full of local bands when I was growing up. If your not at Reading and Leeds you should come down. Manbury Rings is right next to Dorchester South train station and the festival shuts at 10pm so you can get the last train home. There is a bouncy castle, dancing, a climbing wall, DJ's, craft stalls, face painting and much much more. Im going to get my face painted like Spiderman or perhaps like a tiger. I haven't decided yet. I'm told you were amazing in '05 so what gives?